*Everybody knows that quarterback Michael Vick is the leader of the Philadelphia Eagles. Well, everybody except maybe cornerback Cary Williams, it seems. Vick was one of a number of players that jumped in to break up a skirmish between wide receiver Riley Cooper and Williams, who apparently didn’t appreciate Vick’s effort at peacemaking. 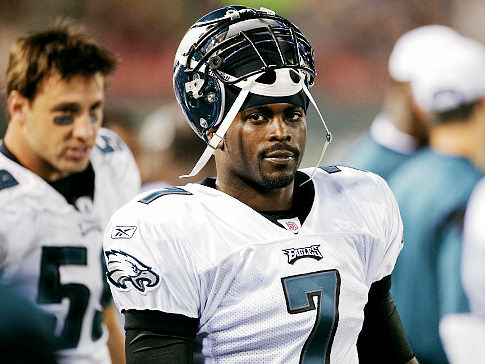 “I try to be the peacemaker, but these young dudes don’t respect me,” said Vick, according to Philly.com. As we reported, Cooper was excused from the team for three days during training camp after he was seen on video making a racial slur at a Kenny Chesney concert. While Cooper apologized to the team shortly after that incident, Williams told the media at the time that he was hurt by the slur and it would take a while for him to accept Cooper’s apology. 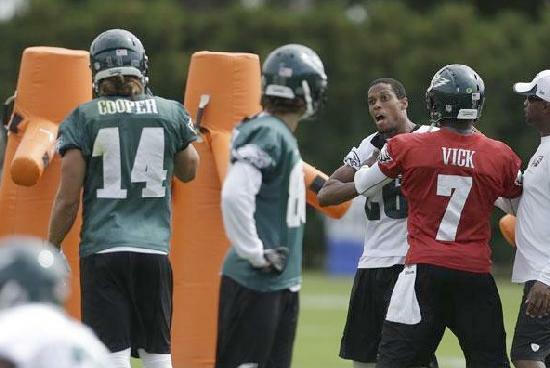 Michael Vick steps in to break up skirmish between Riley Cooper and Cary Williams at Eagles’ practice session. But Vick did speak with reporters after practice and expressed unhappiness with what went down. After all, the first game of the season is Sunday. “Our maturity level has to be on a whole different plane,” Vick said. “Regardless of who the catalyst was for the whole fight, that doesn’t matter. We have to be men. We’re not guys who are out on the street, fighting one another. We’re teammates. It’s game week. We don’t have time for that. I don’t. A distraction is right. But who is really surprised to see the situation develop on the team in light of Riley’s racist statement and the fact that Williams still has not moved on from his stance against Riley. And Vick’s comment about not getting respect from the “young dudes” is problematic to say the least.